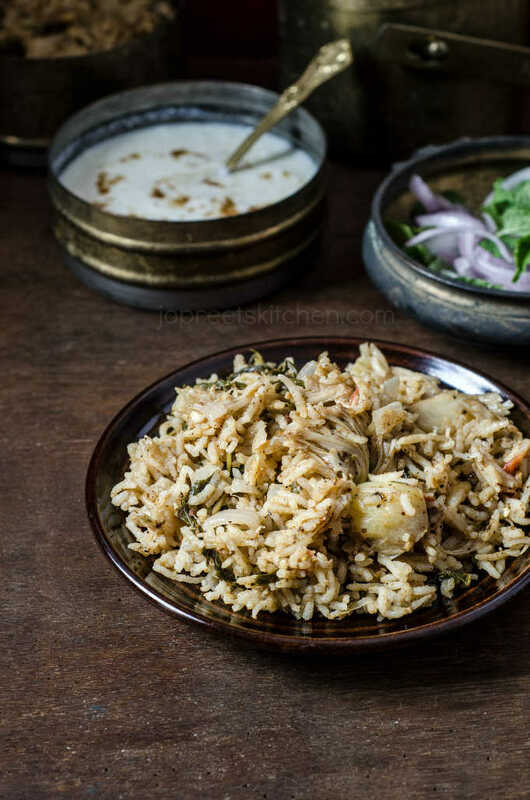 Raw Jackfruit Biryani / Kathal Biryani, today I’m sharing another version of Baby Jackfruit Biryani with homemade Biryani Masala Powder. I had already shared one version of Biryani recipe which you can refer later. 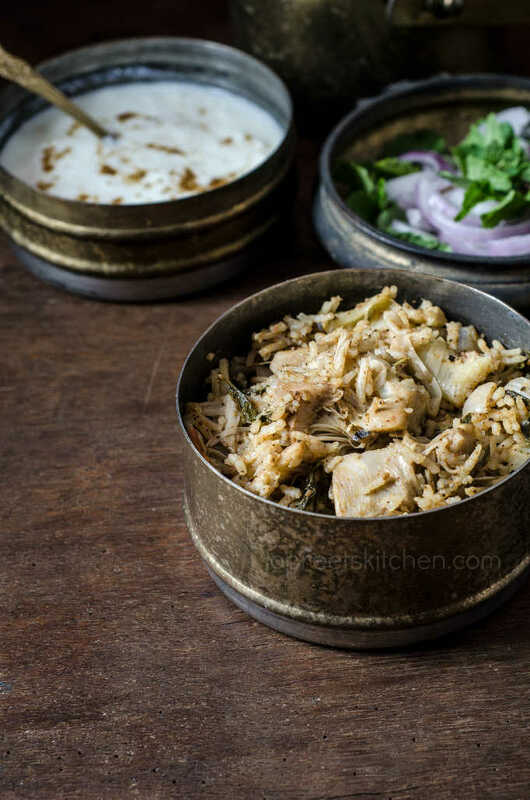 For Raw Jackfruit Biryani, prepare biryani masala powder in advance and store in an airtight container to save more time. To make the recipe vegan, replace curd with non-dairy yogurt. Or instead of using curd, you can also add little coconut milk along with water for the nutty flavor. If you are looking for more number of Biryani varieties, then do check out my page. 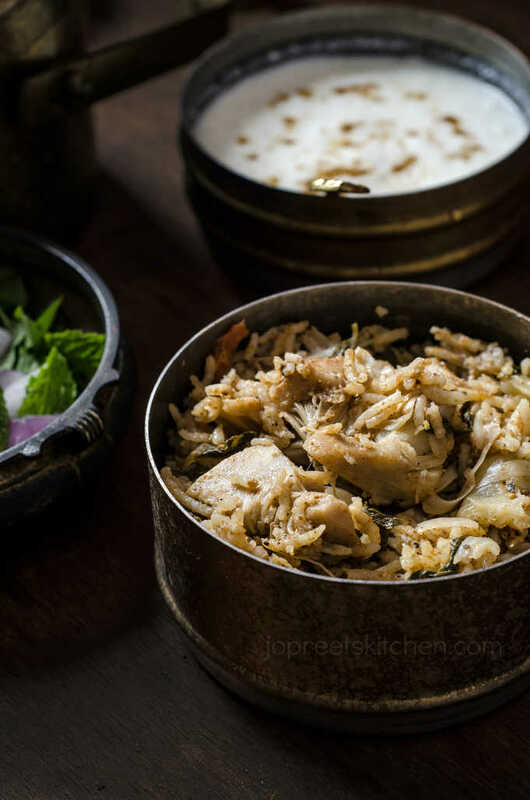 Baby Jackfruit Biryani prepared with homemade Biryani Masala Powder. Apply coconut oil over your hands and knife. Remove the skin and cut jackfruit into small pieces. Put those pieces in water to avoid brown coloring. Out of 700 gms baby jackfruit, I got only 400 gms after cleaning. Heat a pan with enough water and put those pieces in it. Add turmeric powder and salt. Mix everything well and cook on low-medium flame for 5-8 mins. Remove from the heat and drain the water completely. Combine hung curd, red chili powder, coriander powder, ginger-garlic paste and cooked raw jackfruit in a mixing bowl. Add salt to taste and keep it aside for 1 hour. Heat a pan. Dry roast fennel seeds, cloves, cinnamon, mace, bay leaf, cardamom, shah-jeera, cumin seeds, peppercorns till nice aroma comes. Remove from the heat and allow to cool. Grind it in a mixer along with dry ginger powder and nutmeg powder. Do not add and grind till you get powder like consistency. Keep it aside. Heat 4 tbsp oil in a pan. Add chopped onions and saute a while. Now, add mint leaves and chopped tomatoes. Mash the pulp. Add marinated raw jackfruit, masala powder and ½ cup water. Cook it covered on low-medium flame for 10 mins. Add 6 cup water and let it boil. Now, add rice and salt to taste. Adjust salt and spice level. Stir well everything and cook it covered on low-medium flame for 5-8 mins. Heat 4 tbsp oil in a pan. Add chopped onions and saute a while. Add mint leaves and chopped tomatoes. Mash the pulp. Add marinated raw jackfruit and stir well. Add masala powder and 1/2 cup water. Cook it covered on low-medium flame for 10 mins. Jackfruit? Haven't tried yet.. will definitely see..